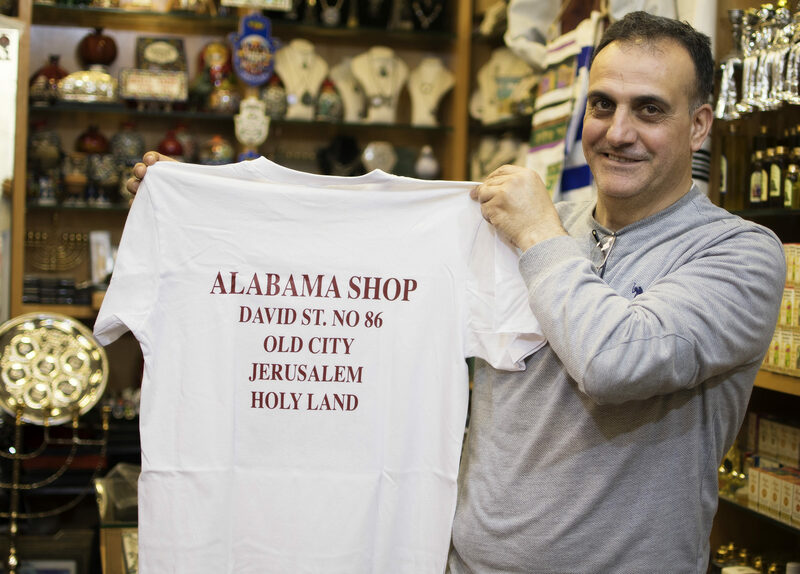 In one shop-lined passageway of Jerusalem’s Old City, a Penn Stater who yells “We Are…” might get the response: “Alabama!” Old City shops are known for pulling in visitors with their Jerusalem-themed clothing and crafts. One shop, however, stands out from the rest. The outside of the Alabama Store on David Street in the Old City. ~ photo by Kat Procyk. It’s titled ‘Alabama – The Heart of Dixie’, and is located in between the Christian and Armenian Quarter of the Old City. 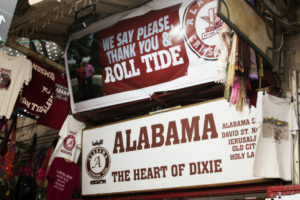 Its owner is Palestinian-born Hani Imam, who is forever connected with the University of Alabama. Imam’s shop wasn’t always dressed in the crimson, gray and white colors of his alma mater. In the beginning, it had a single Alabama sign. It was there to remind Imam of his ties to Tuscaloosa and his fervent love of the school. Hani Iman, Palestinian-born owner of the Alabama Shop, located on David Street in the Old City. Iman is a proud graduate of the University of Alabama and said Alabama related gifts have been good for business. “Roll Tide,” Iman said. ~ photo by Kat Procyk. ‘Roll Tide’ is written across many of the shirts, glasses and tiles, translated from English to both Hebrew and Arabic. Along with the Alabama-themed items, there are wooden crosses, silver and gold jewelry, and pieces of framed Roman glass. While the clash of cultures may seem odd at first glance, it hasn’t hurt business for Imam. His shop attracts customers from all over the world, especially Americans.